Snow is here this summer! But don’t worry, there’s no need to wrap up – it’s just BAL’s new brilliant white shade of Micromax2 Grout! Formulated with the same built-in Microban antimicrobial protection for walls and floors, BAL Micromax2 Snow is highly flexible and rapid-setting in only 3 hours. Available in 2.5kg, 5kg and 10kg bags and supported with a colour-matched silicone sealant, BAL Micromax2 Snow provides the perfect match with white tiles, or to contrast darker shades. The new brighter shade of white extends the Micromax2 core colour palette to 11 including its original shade of White, plus Manilla, Jasmine, Gunmetal, Pebble, Ebony, Smoke, Chocolate, Cocoa and Anthracite. Designed and developed with fixers, BAL Micromax2 provides ultimate all-round protection against mould and is recommended for domestic and commercial installations due to its enhanced durability and flexibility. 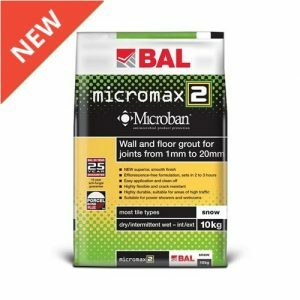 Because of its durability and flexibility, BAL Micromax2 is perfect for power showers, wet rooms, heated floors and timber screeds in a wide variety of projects ranging from domestic bathrooms to leisure centres, shopping centres, changing rooms and restaurants.